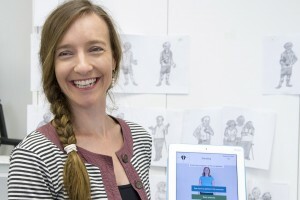 Dr Kim Delbaere and her research team have created a home-based training program that can be loaded onto an iPad to help improve the balance of those over the age of 70 to reduce their risk of falls. What made you think of creating an app for the Standing Tall program? We need older people to do balance exercises for two hours per week, if we want to prevent falls. Many people prefer to do exercises in their own home at their own time, instead of attending group exercise classes. However, the challenge there is that it is difficult to offer an individualised, progressive and varied program without a trainer. So we thought, how can we make things more interesting while having the right type of exercises that will engage people for a long time? We asked people how they would like to do the exercises and got the sense that the iPad is the way to go. The Standing Tall app has more than 2000 exercises and it remains fully tailored to the individual as their balance improves. We have over 250 people in our study so far, about 150 people have used the app for 6 months and 50 people for 12 months. So far, the feedback from the participants has been very encouraging. Some people have told us: “I can feel my balance is improved in everything I do”, “Standing Tall has motivated me to exercise more regularly”, “I am more confident about not falling” and “This is the first program that makes me set aside time because I know these exercises are good for me”. Overall, our participants enjoy exercising with our app, because they notice just how much the program was helping them. What does a round of exercise look like? The premise is that a person has to do two hours per week, and every week starts fresh. They can choose their session length – so 10 minutes twice a day or do 40 minutes in one go. Depending on the time a person chooses, the session will be slightly different, but basically they do balance exercises. Are there materials other than the app? The exercise equipment includes a foam mat, to create a wobbly surface, a step-up box and a stepping mat. Together, these materials provide a huge variety of exercises. The exercises get people to step in patterns, sometimes including stepping on the box, and there is a metronome so people can practice stepping to a beat. The exercises include challenging standing balance, walking and stepping; there is a great deal of variety. We have videos and voice-over instructions to guide people through each exercise. Do you have to be confident with technology to use the app? We have a huge number of people who have never had an iPad or aren’t very computer literate; however, the large majority (if not all) of our participants feel very confident using the app. The app was developed in consultation with a focus group of older people. Trini Valenzuela (PhD student) and Ashley Woodbury (Research Assistant) were instrumental in this process. Together with engineers Thomas Davies and Jonathan Yeong, they were able to incorporate the many recommendations and suggestions that we received from our focus groups and have made the app a piece of (evidence-based) art. How will you know if the app has been successful? On a scientific level, we want to prevent falls. That’s our primary aim. We know that over one third of people over the age of 70 fall once a year or more. We also know that we can prevent falls in older people if they do the right balance exercises for two hours a week, for a minimum of six months, but preferably longer. Previous research following these recommendations has shown reductions in the number of falls of up to 40 percent, and that’s what we hope to see. On the other hand, our current drive is noticing how our Standing Tall app improves people’s quality of life, which is a measure of success in itself. The study still requires Sydney-based participants over the age of 70. To register your interest or ask questions about participating, give them a call on their general information number 9399 1888. The Standing Tall team will get back to you within 5 working days.